American Robins kick off our regular morning with their cheering and rich voice ever since spring was here. Every now and then, I heard the crispy chirps from house finches and gold finches right by the bedroom window. They may all come a bit too early for me, but I would rather be called by them than the alarm clock. I have been spending most of my time handling camera and working on photos in front of computer. My desk pile is heaping high and my house is getting cluttered. I started feeling guilty and the words of addiction, indulgence and procrastination were pounding on me. I finally dropped everything photography-related, and spent a good whole day to clean my house. Oh, mine. Nothing is more relaxing than sipping an iced lemonade in a room with shining floor and fresh smell. It was a glorious day. We took an hour bike ride at a wooded area early in the morning. I did not touch a bike for 16 years. When I finally got on my bike again, I fell from it the next year and injured my left shoulder, but that did not stop me. I am on my bike again and feel better than ever. 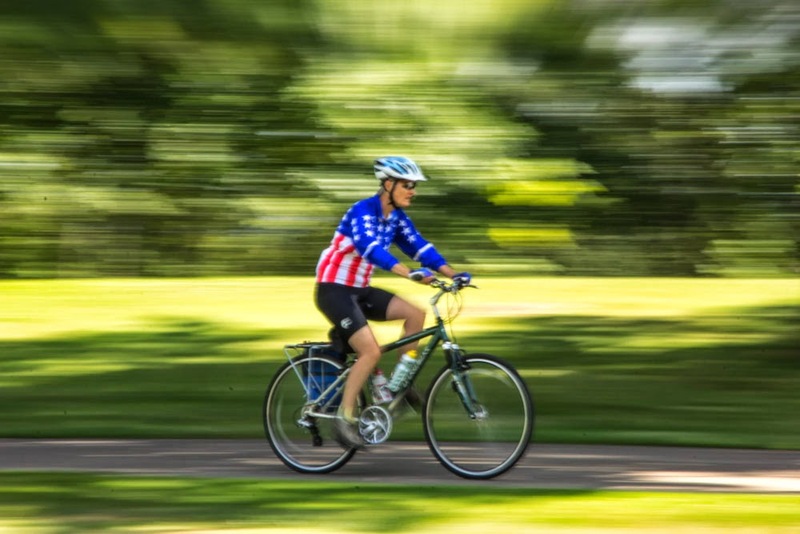 It is also fun to snap a few panning shots of other bikers on the trail. to see people on the bike than behind the car wheel. This natural path of exercise is appealing. Energized by the bike ride, we worked hard to re-organize the shrubs and flower plants in our yards. New arrangement is based on ‘less is more’ theory. So glad to get rid of overgrowth and stringy mess. I feel great when all are trimmed and looking tidy and tight. There was no single bird come by this spring till early May. I planted three hummingbird loving plants in April, but they did not show up till about four weeks ago. There are two regular hummingbird visitors, but I can never be ready enough to get a good shot. I could have aimed at one spot by the feeder and nail just that perfect shot, but that is not what I want. I prefer to photograph hummingbird sucking nectar from a flower and I thought they will be on the three targets that I had planned. But no, they have been flying all over the place and tasting everything. I am chasing after these two little guys without much success. I love to see both of them around, but then they would fight each other off and I ended up with no one. 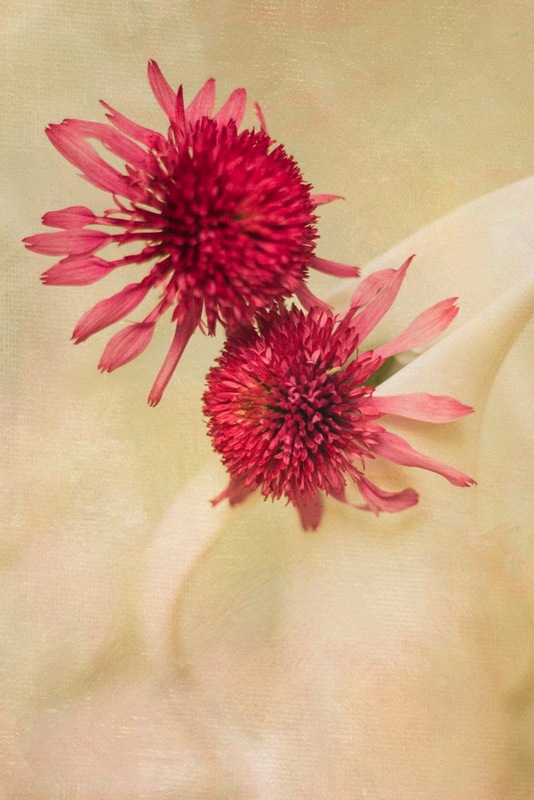 I painted the flowers and added the texture. I found out that I really like painting though I have not been able to do a lot. It is a new adventure for me and experimenting process is exciting. 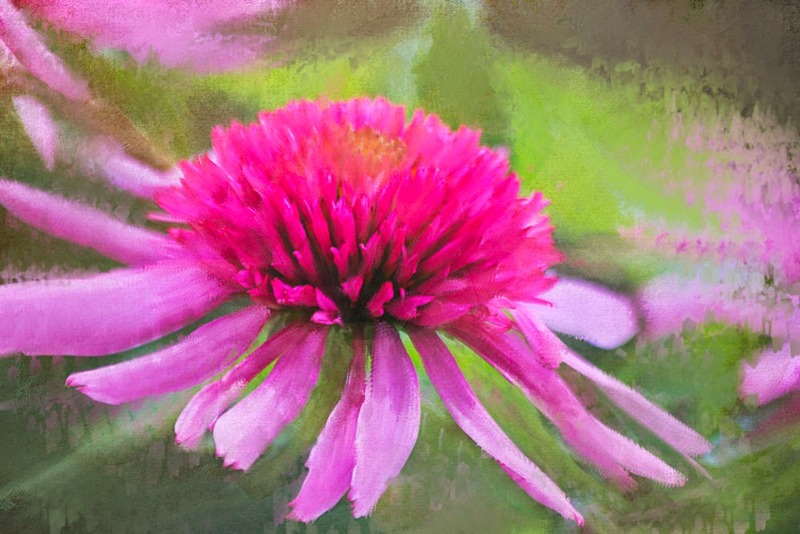 It seems to me that not all photos make good ‘digital’ paintings and not all work I tested turns out to my expectations. Some turned out to be disastrous and some, so unexpected that therefore, so interesting to me. It is not a snap, edit and finalize process. It is more an artistic journey that I have no clue what I am getting into it till I really got there. Without any formal schooling in arts, I used my instinct and heart to paint. The process is slow and lengthy, but I truly enjoyed it. It is a good training for my patience, my sense to colors and further understanding in the making of an art. I took a few corn flower pictures. The flower is pretty, but I feel my shots look homely. I did not like the fact that the colors are all so bright and overpowering, but they are the true colors that I did not want them to be deceived by the texturing. Instead, by painting, I got to keep all real colors and shapes. Most of the time I like the image to look dream-like, but this time, more realistic and only slight brush touches. 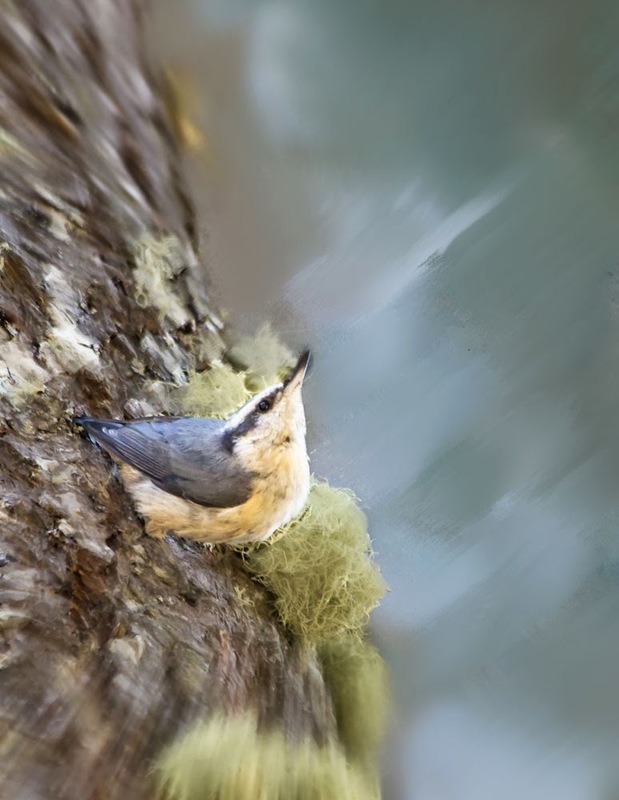 Besides Humminbird, Nuthatch is one of my most favorite backyard birds. They just showed up couple weeks ago. I like their curvy gesture and unique personality. They came, grabbed a bite and left. Quick and sleek. They are also not too afraid of people. They must have figured that they can get away fast enough and they know, I like them so much that I won’t never hurt them. My eyes have been on hummingbirds. 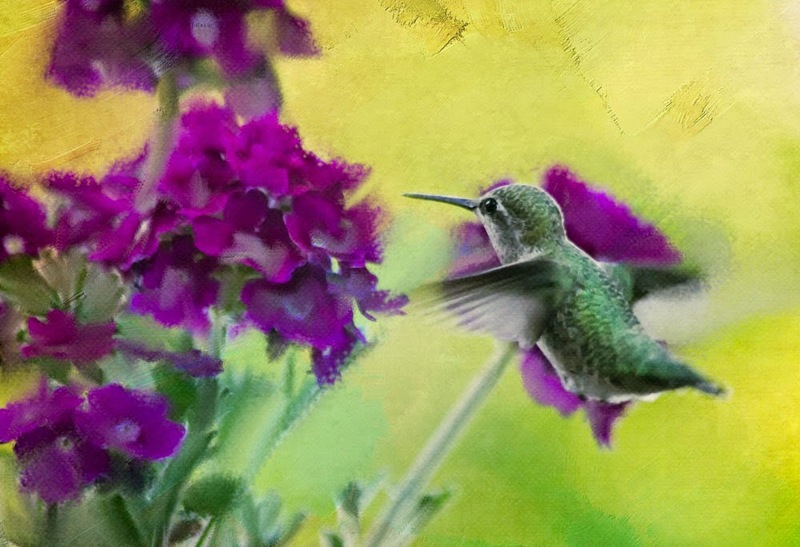 One day I saw one hummingbird stopping on one corn flower and sucking nectar from the other. It was such a rare scene, but I was not ready to capture the shot. So I waited and waited, but I have not seen that again since. Though corn flower blooms seem to last, but the color is fading. I hate to see them go without keeping myself some memories. So I brought them into the house and place them in my favorite vase. Still shots are growing in me and I particularly like the feel of softness and subtlety. I am not big in home decors, but I have a special liking for white flower vases. Intentionally I used a beige color backdrop for the sculptured shape vaguely shown. And, instead of showing a perfect full bloom, I chose to focus on a smaller portion. Slight texture was intended to cover up the blemish on the fabric and it unexpectedly added the ambiance to the frame. Action, color, excitement and fun would eventually come down and be replaced by peace and quietness when dusk comes and silence embraces the night. A cheerful morning call, a relaxing bike ride, a squeaky clean house, a few visits from my favorite birds and a few attempts to paint my flowers have made up a wonderful week for me. Simple and easily satisfying.